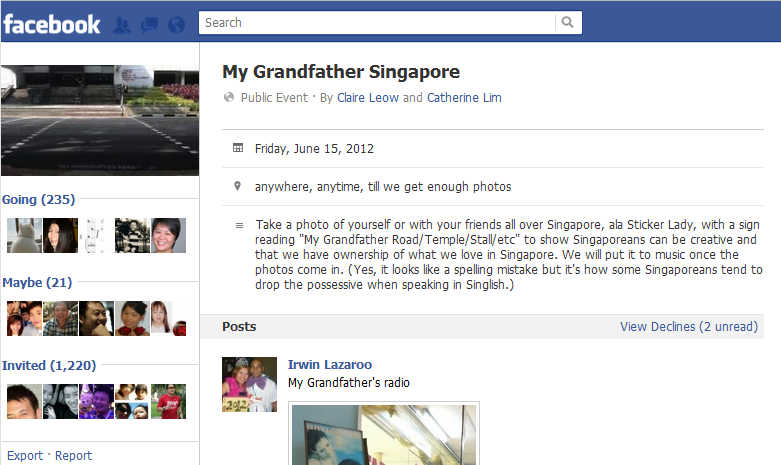 This is the extent of my contribution to something called My Grandfather Singapore on Facebook where Singaporeans are asked to take a photo of themselves "all over Singapore, ala Sticker Lady, with a sign reading 'My Grandfather Road/Temple/Stall/etc' to show Singaporeans can be creative and that we have ownership of what we love in Singapore". No, wait, I wrote it wrongly. 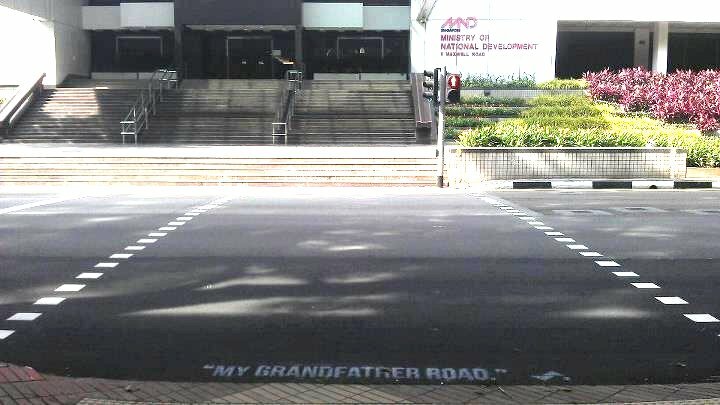 It should be "My grandfather grandson". Actually, I wrote it correctly the first time, but in this case, being right is wrong and wrong is right. 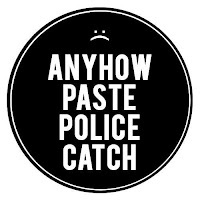 As the people behind the My Grandfather Singapore Facebook thing pointed out (in parenthesis): "Yes, it looks like a spelling mistake, but it's how some Singaporeans tend to drop the possessive when speaking in Singlish." Actually, it looks more like grammatical error than a spelling mistake, but I quibble. 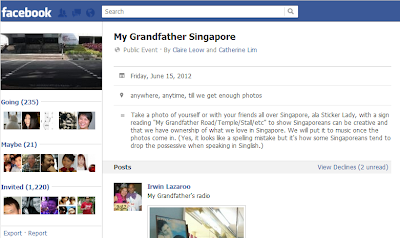 But you know who is one of the people behind the My Grandfather Singapore Facebook page? Fortunately, it's not the Catherine Lim whose books are taught in Singapore schools. How can a Ministry of Education-approved author be encouraging us to use broken English? Did I send Phua Chu Kang to take English classes as instructed by then-Prime Minister Goh Chok Tong all those years ago for nothing? Were 13 years of the Speak Good English Movement for nothing? Did I do a spellcheck for this column for nothing? What hath Sticker Lady aka Samantha Lo wrought? 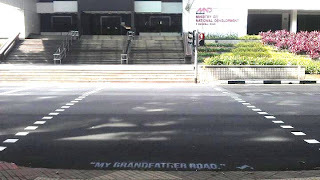 Lo was arrested last week for painting "My grandfather road" on public roads. She is also allegedly behind the black stickers pasted on traffic lights around Singapore. On Facebook, MP Tin Pei Ling, Nominated MP Janice Koh and non-MP Nicole Seah have written in Lo's defence. Lo has since been released on police bail. 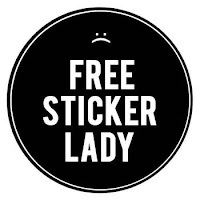 So why are slacktivists stepping over themselves to jump on the "Free Sticker Lady" bandwagon when she is already free? Why are Sticker Lady's supporters pre-emptively sending her to jail? But where were these "let's support creativity" types two years ago when Swiss Oliver Fricker was arrested for spray-painting graffiti on the MRT train? Where were Tin Pei Ling, Janice Koh and Nicole Seah back then? No, wait, Koh wasn't NMP and no one heard of Tin or Seah back then. Why wasn't there an online petition for the Ministry of Information, Communication and the Arts (Mica) to recognise Fricker's work as "art, not vandalism" (like the petition to Mica to "review sentence" of Lo, even though she hasn't been sentenced yet)? Is it because Fricker is a foreigner? 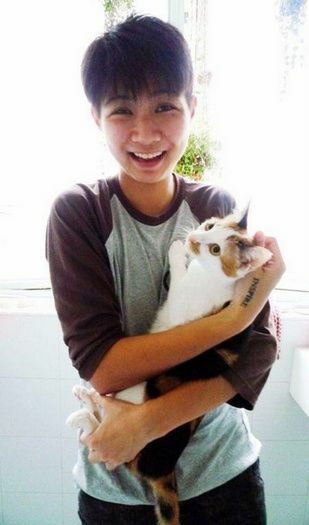 And not a cat-loving 25-year-old Singaporean who worked for the National Art Gallery? It's probably also a good thing Lo doesn't drive a Ferrari or wear a scarf on the bus. And being a foreigner, Fricker would've never thought to spray-paint the train with "My grandfather train" - or even "My grandfather's train" (with the possessive). 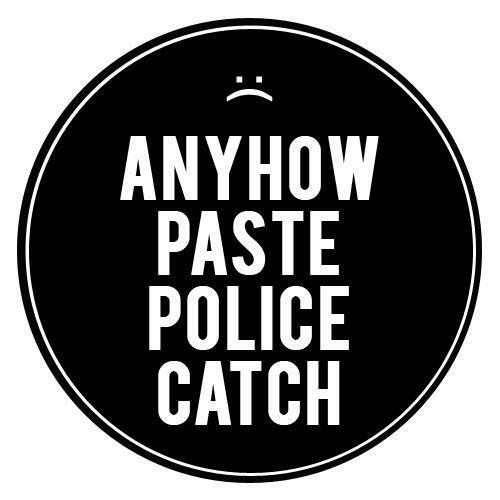 And unlike Fricker, Sticker Lady has also sparked more intense discussion about art than the recently-concluded Singapore Arts Festival ever did, just as the festival organisers announced last week that the festival is taking a break next year for reassessment. Perhaps if they want to avoid low attendances like for last year's festival, they should resort to vandalism too. 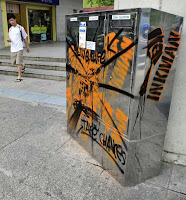 But don’t do what the Singapore Post did in 2010 when it had post boxes around Singapore spray-painted with graffiti for a publicity campaign. That just upset people. In this case, wrong was not right. Wrong was just wrong. SingPost's gaffe was that the graffiti wasn't in Singlish. It should've had the post boxes spray-painted with the words "My grandfather post box". Remember to drop the possessive. Which brings me back to Catherine Lim's (but not that Catherine Lim) My Grandfather Singapore project on Facebook to get Singaporeans to show that they can be creative by following her instructions to basically copy what someone else did. Do what you're told and copy. 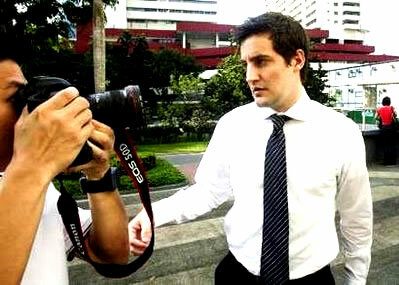 And that, ladies and xenophobes, is the state of creativity in Singapore in a nutshell. By the way, why is Lo called Sticker Lady and not Grandfather Lady? I guess it's all relative. Was U2's last album that bad? Gaga's gone, let's protest Katy Perry!